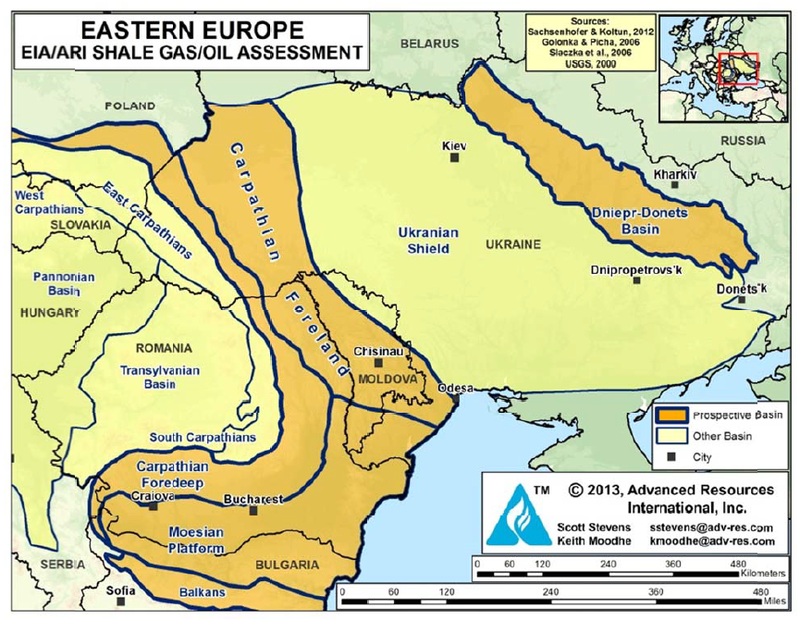 Open Europe: Could Ukrainian shale gas break Ukraine's dependence on Russia? Could Ukrainian shale gas break Ukraine's dependence on Russia? Could Ukraine's shale gas turn the tables on Russia? Ukraine is currently both dependant on Russian gas imports (60% of Ukrainian gas comes from Russia) and a major transhipment route for gas to Russia's export markets in the EU. 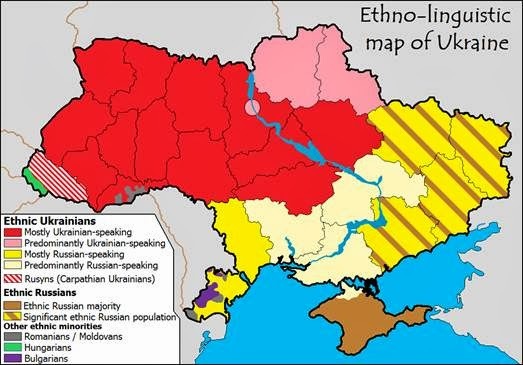 This has historically put Ukraine in a weak position vis-a-vis its eastern neighbour. A fact underlined in the last few days when Gazprom increased the price it charged following the change of government in Kiev, forcing Ukraine to seek emergency finance from the west. This could however change. Ukraine has two large shale gas deposits, one (the Lubin basin) in the Ukrainian speaking west and another (the Dniper-Donets basin) in the Russian speaking east. The eastern one has, according to the energy consultancy Advanced Resources International, nearly 76 trillion cubic feet (Tcf) of potentially recoverable gas, the western basin shared by Moldova and Poland another 72.5 (Tcf). For context, the same consultancy suggests there are 26 Tcf in the UK and 136.6 Tct in Poland. These deposits are therefore sizeable and close to existing pipelines making both production for domestic consumption and export possible. If Ukraine could attract investment to develop these fields then it could measurably improve its energy and economic independence from Russia. However, Ukraine should not get its hopes up quite yet. Although large in themselves the deposits are small by US standards (they have 1,161 Tcf of technically recoverable shale) and for that matter Russian (285 Tcf). It is also unlikely they could come on stream in the near future. The larger, more obvious problem is political instability. The eastern basin falls exclusively in the Russian speaking part of the country and until the impasse with Russia is broken it is unlikely international energy companies would want to sink the investment needed into an unstable political environment. So if energy independence could help Ukraine escape from Russia's orbit and calm the political crisis, it cannot do so until it has settled its current dispute with Russia. Of course Russia knows this too and Ukraine's shale reserves therefore present another factor in this deeply complicated and difficult geopolitical standoff. Oil-executives say it is perfectly safe and ok as long as it is done far from where they live. What is happening with the Nabucco-pipeline? 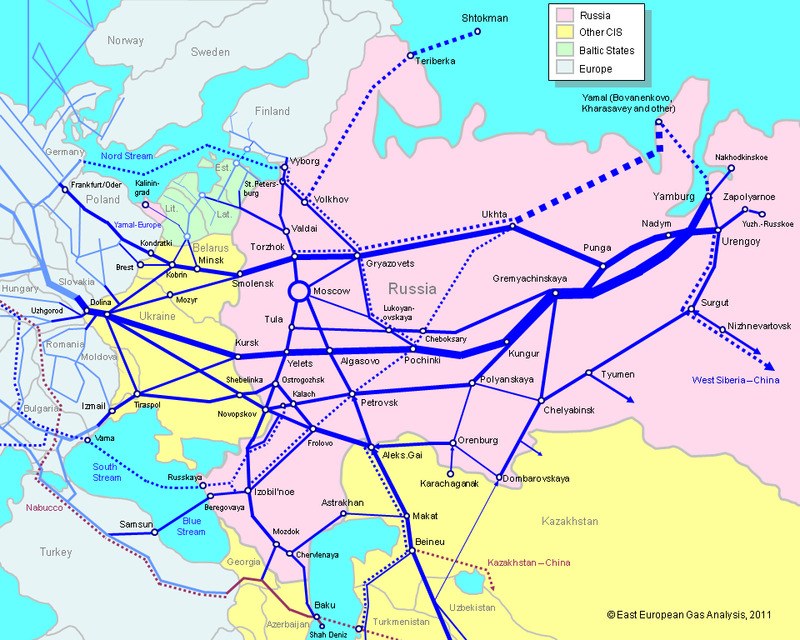 Could the Ukraine be hooked up if the pipeline would be built? I'd be more worried about the targeted trade sanctions that Putin would impose in retaliation of any sure rattling by the eussr. So the EU want to cash in on their investment in the Ukraine. Having destabilised the whole country with their EU Rentamobs and their bi-partisan snipers - the EU will be most willing to trade the Crimea to Russia.